Employers have a new tool to measure how stressful their workplaces really are. 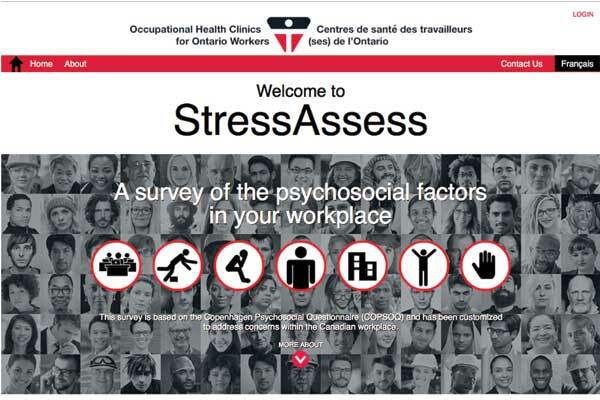 The Occupational Health Clinics for Ontario Workers (OHCOW) and the Canadian Centre for Occupational Health and Safety (CCOHS) have collaborated to create StressAssess, a free online survey tool to assist workplaces in identifying and addressing psychosocial hazards that can lead to stress and mental injury. “Workplace stress is a serious health and safety hazard that can take a significant toll on worker health. It is particularly challenging to address because it does not fit into traditional hazard categories such as chemical, musculoskeletal or slips and falls,” said Valerie Wolfe, executive director, south central region, at OHCOW. Employers administer the survey in their workplace, which gathers anonymous and confidential data about current work conditions and psychosocial hazards. The survey administrators are guided through a five-step process supported by instructions, templates and reminders. Upon completion of the survey, a summary report is provided. Along with comparisons against validated national averages, it includes practical ideas for action to help workplaces address identified concerns. While the survey tool is meant to diagnose the workplace (not the worker), the website also includes a personal edition for individuals interested in measuring their own personal level and sources of stress. StressAssess is available at www.stressassess.ca and a mobile app version is currently in development. This product write-up originally appeared in the April/May 2018 issue of COS.